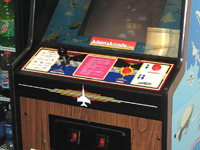 A few games restored by AdamsArcade.com, both past and present. Want to see all the gory details? Visit the Restorations page. 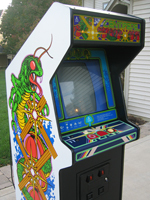 This original Centipede was a restoration I did for the 2007 Festival of Trees Auction, put on by the Junior League of C-U. If you plan to attend the Festival this November, bid on it! Everyone wants a Galaga. 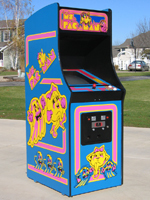 I finally restored one for the 2006 Junior League Auction, from a beat-up cabinet I picked up at um... a different kind of auction. See more on this one on the Restoration Page. 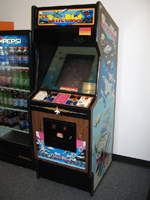 This DK cab had been converted to a Choplifter at some point, and I converted it back in Spring of 2005. 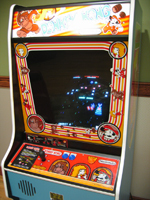 I rewired it for JAMMA, installed a new 19" monitor and a multigame kit, which plays Donkey Kong, Galaga, Ms. Pac-Man and Frogger. 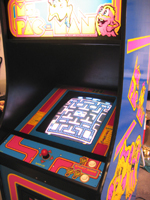 This game is currently for sale at Exile on Main St., located in One Main Plaza, downtown Champaign, Illinois. A Time Pilot upright, restored to original specs. 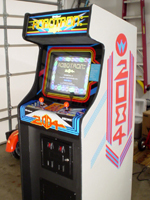 This was rewired, had a new old stock marquee installed, capkit on the monitor, controls were rebuilt and a high-score save kit installed. 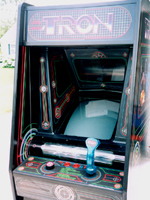 A new joystick handle and repro control panel overlay finished it up. I restored this in the Fall of 04 and donated it to the Festival of Trees Gala Auction, put on by Junior League of Champaign-Urbana. 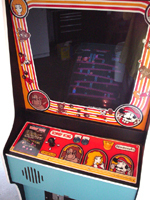 I acquired this as a gutted cabinet and coin door, and had to replace and restore everything else. 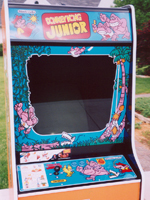 A Donkey Kong Jr. converted back from a Do Run Run. 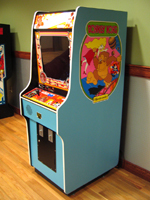 This one was stripped, rewired, repainted, had controls rebuilt, new artwork applied, t-molding installed, and coin mechs cleaned and rebuilt. 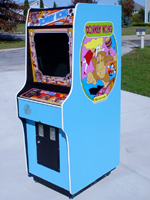 Finally, a Double Donkey Kong game board was installed, allowing both Donkey Kong Jr. and the original Donkey Kong in the same cabinet. 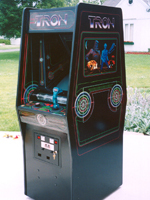 This game was sold at Exile on Main St., located in One Main Plaza, downtown Champaign, Illinois. This was a restoration I did for a co-worker. 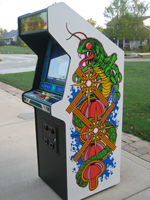 The game actually worked when it arrived, but needed new capacitors in the monitor, new paint, sideart and control panel overlay, new lighting ballast, controls cleaning, coin door work, etc. 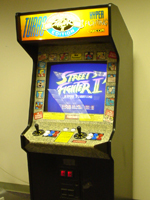 The one that ushered in the era of fighting games. 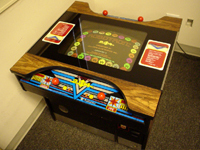 This unit required a replacement game board, new marquee and bezel art, monitor adjustments and a LOT of cleaning. 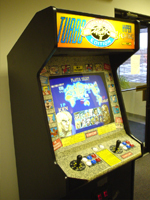 Recently it was rewired for a Multi-JAMMA kit, allowing up to eight different games to be played at once. This is the actual cabinet pictured on KLOV. 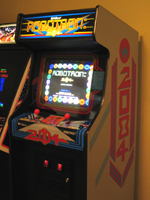 The cocktail version of Robotron is rare, so this was especially fun to restore. 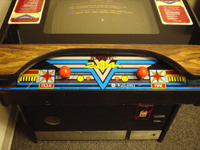 The game boards were repaired, and capacitors replaced on the monitor. The controls received new switches and the top glass was repainted. An NVRAM high score upgrade was also installed, good for 20+ years! One of the all-time greats. I bought a gutted cab from a friend in Decatur and restored it with new and original parts. 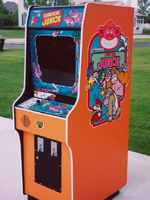 Like the DK Jr. above, this one received a Double Donkey Kong upgrade. This particular unit was donated to the auction at the Junior League Festival of Trees Gala, 2003. A true classic, and one of the most brilliant videogames ever designed. This was one of my toughest and most enjoyable restorations. Aside from all the usual work, I re-stenciled the sideart by hand. To see more details on this one, visit the Restoration Process page.